It all started about two weeks ago. We are boondocking in the yard where I work. Things have worked flawlessly so of course, that means something has to go wrong and sure enough we encountered solar problems. After plugging in a USB fan, we would wake to a dead battery. So I decided to pay closer attention to the Solar Charge panel and we noticed that our charge volts from the panels were cut in half. We first noticed the problem when we were boondocking down in New Westminster. Our battery was only charging half way, and we were running out of power before we would head to bed. 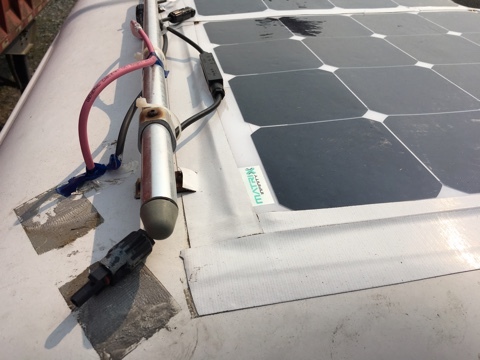 I climbed up on the roof of the camper van and metered the panels individually. One panel was putting out 12 volts as it was supposed to. The second panel, however, was only reading an output of 58.4 m/volts. Seriously, how could a panel that was less than 23 months old not be working properly already? Though I know with my luck, if something could go wrong it would, and it would happen to me. The last thing we need is solar problems. Michelle is about to start her new job, I am working tons of hours, and we have yet to get a BC address so even if I was able to get replacements, we had no place to have them sent!! My first thought was to contact Solar Warehouse, which has now changed their name to Solar Wholesalers. Hmm, strange, but sure enough I was able to get ahold of them and at first, they were none too interested in standing behind their product. But after some conversation and emails, they said they would contact the manufacturer and have them RMA’d (returned). I had to prove I had not damaged them, so I sent a series of pictures. But this past weekend something interesting came about. A friend of mine (Mike) was down and I was telling him the problem, and being a handy guy that he is, he climbed up and took a look. He discovered that one of the leads coming from the panel as loose. He decided to loosen the cap, and while doing so the entire wire fell free. It’s kind of interesting, as a kid I used to be very much into taking things apart, but in this situation, I reverted to the brain washed consumer and was simply happy to return the panel for replacement, paid the shipping and away it went. I have to stop thinking like that and dive back in and trouble shoot things more closely. Today, I went to Fraser RV, looking for Cabinet Catch for one of my doors in Freddy. 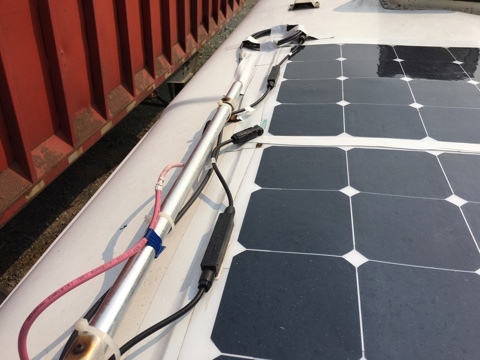 I thought I would ask some questions about batteries for my solar and sure enough, as soon as the Service Department person got a look at the camper van his attitude changed and wanted to get rid of me as fast as possible. In the end, I am glad Mike took a look and I was able to repair the panel right there. I needed to be reminded we can fix most problems, whether they are solar problems, electrical or mechanical.